Yay so this is the start of my new weekly news round up! Every Monday morning you can log on here and get the latest news blast from the world of la mode! It’s Kristin but its not???? 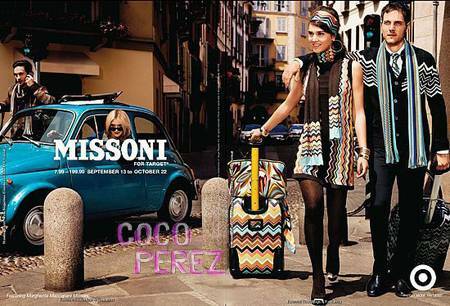 Missoni has teamed up with US retailer Target, to launch the latest designer range at the stores. Missoni print (see here) is a clear favourite of mine and the collection promises to bring the same design at less price. This week more images of the collection were released in the US. Unfortunately, the line is only available in the US. [image from cocoperez]. Topshop NEWGEN have announced the winners of its sponsorship for the upcoming season at LFW. No surprises that Louise Hay, David Koma, Holly Fulton and Michael Van Der Ham are on Topshop’s radar as some of Britain’s brightest and most promising design talent. I was at all the Topshop NEWGEN shows in February and as always, collections did not disappoint. (image from the British Fashion Council). The front row favourite Nicola Roberts debuts her second single next month, and the video is colourful and ever so cute. Wearing a mini floral print dress and leopard print pants, it’s styled so it’s understated but typicall Nicola. Definitely my favourite Girl’s Aloud member. And she can dress.